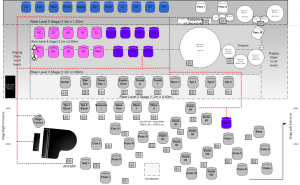 You are here: Home / Visio Content / Shapes / Drawings & Templates / Visio in Concert! When I showed up at the Gasteig performing arts center early Saturday morning for our final dress rehearsal, the folks in charge of logistics were dutifully following a Visio plan that covered every detail of how the stage should be setup. 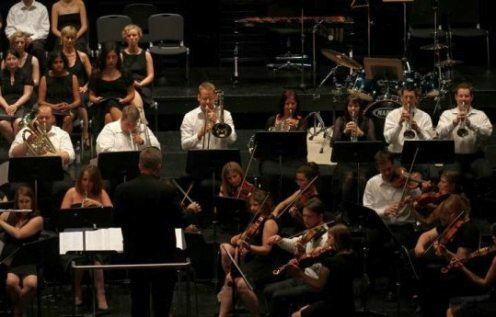 In case you didn’t know, Visio Guy plays trombone with the TT Orchestra & Singers. They are a group of jovial amateur musicians in Munich, Germany who have decided not to let all that practicing they did as kids go to waste. The group is English-speaking, and has quite a few members who are expats living in the greater Munich area. If you are interested in what the TTers are up to, you can follow us on facebook. Not a bad program, eh? 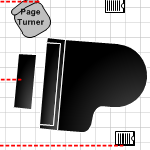 You can find the Paper tray on the Maps & Floorplans > Building Plan > Office Accessories stencil. One of the choir members needs a walker to get around. Since the stage had three levels of risers, we needed to make sure she could get to her position. 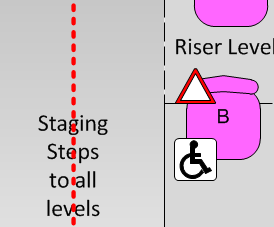 The Warning sign and Handicap symbols were used to call attention to this on the Visio plan. You can find these shapes on the Visio Extras > Symbols stencil. On Saturday evening, the performance went on without a hitch. The well-organized stage played a big part in this. We had quite a bit of fun performing, and the audience rather liked it too! If you are interested in downloading the Visio file, please let us know by leaving a comment below! 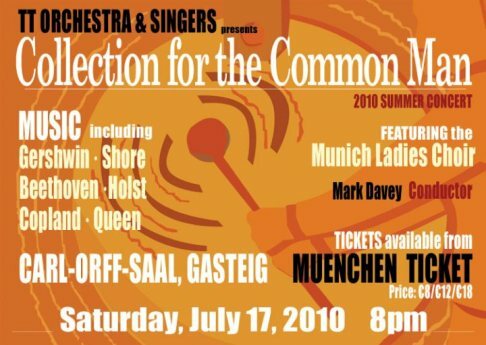 And if you are coming to the Munich area in the future, be sure to check out the orchestra-and-singer’s web site to see if we’ve got any upcoming performances! The director used Visio 2000. We’ve got to get him upgraded! We’ll probably not be touring in this decade (haha), but hop a train and come down to Munich some time! @trex: you know if you *invite* us (i.e. provide a venue, some expenses) we *might* make your wish come true (and we’ll even drag VisioGuy along too…) He’s actually a pretty nifty Trombonist too! But, to be serious, Visio is the only tool practical enough to use and update for our purposes. Am delighted VisioGuy liked it – chuffed he’s published it on this site, but in reality, just one of the many ways I use visio in normal life. And yes, I need an upgrade! Looks like we’re gonna need a virtual tour bus, then! 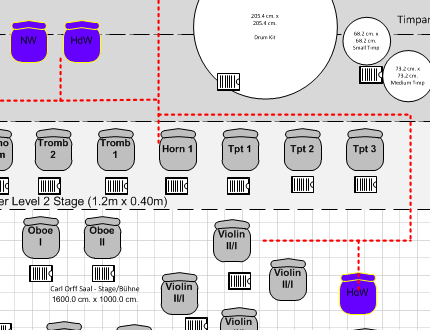 I recently did a similar visio drawing for a concert my son was performing in and i had offered my services (sadly for free) to help with the organisation. It worked really well and the school are going to use it for all concerts from this point on. This is a good but more unusual use of Visio – and a better use of my time than randomly helping to pack up chairs etc. Thanks for relating, Debby! I can’t count the number of odd-but-useful things I’ve used Visio for. It was a pleasant surprise to see my fellow musicians and folks like you doing it as well! Nicely done! Do you know of any instrument shapes available to help with stage & field layouts for high school marching band? Drat! I forgot to ask if we could download your drawing? The file is now available for download! 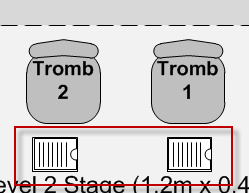 This looks like a lot of what I’ve been looking for to use for planning orchestra pit setups where space is crazy limited. Is there a purchasable stencil for this? I’m not aware of anything for purchase, but it’s always worth a search. ShapeSource has a lot of stuff. If you leave a detailed list of the shapes you would need, there might be a chance I, or some other intrepid shape designer could get around to it one of these days. Yes, I would like the Visio file please. Thanks!